AirPods 2 review: More of the same from second-gen in-ears? While the headline announcement is a wireless charging case, the real winner for the second-generation AirPods is the better managed battery that delivers a noticeable improvement in talk time between charges. Otherwise the divisive design remains the same - but there's now something equally iconic about that. When the Apple AirPods first arrived, to say they were polarising would be an understatement. The now iconic Apple headphone design ignited a fire amongst users - with some keen to disregard them as nothing more than an ugly gimmick. A number of years on, AirPods have become omnipotent with commuters across the globe. Apple's design might have been slammed at launch, but now it stands out amongst a sea of wireless buds from an array of manufacturers. Off the back of such divisive controversy, do the AirPods 2 deliver? We've been using the second-generation in-ears to find out. The new AirPods are identical in design to the old AirPods, with the same simple white design. 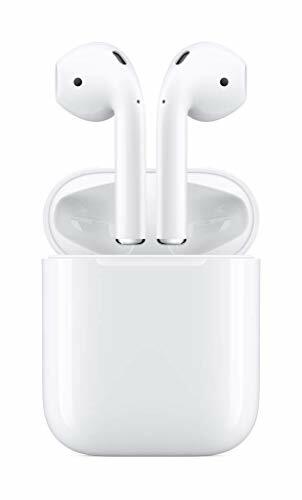 As before, the AirPods sit in the opening of your ears with a small rod protruding out and down your face, holding them in place. There are no ear hooks, no tight fittings, no adjustability in any way. That means they are incredibly easy to put in and out of your ears, are comfortable for wearing over long periods of time, but can become dislodged if you move too much, like when out on a run, for example. With no visible controls, you're left to a basic programmable touch option, or using your voice for everything else. That would be a problem for most, however the AirPods will automatically pause your music when you remove them from your ear, and it's not hard to say "Hey Siri, skip track" now that Siri is built in. The AirPods still come in the same easy-to-pocket case, which also doubles-up as the charger. It's similar in size to a packet of dental floss and will easily find a home in your pocket. Flip the lid at the top and slip the AirPods in - it's that easy. While the charging light - which shows green or orange - was inside the case of the original model, for the second-gen it's moved to the outside of the case. Which makes far more sense. For those keen to ditch wires completely, there is a wireless charging case option that allows you to plonk your AirPods onto a Qi-enabled charger. Note: this makes for a £40 premium over the non-wireless charging case option (£199 vs £159), or you can buy the case separately for £79 on its own. Charging is slower than via a wired connection, but there's plenty to be said for ease. If you've got a charging pad at home it's easy to drop the AirPods on to charge, but then we've never really found it a problem to plug them in via a Lightning cable either. With the promise of up to 24 hours of total listening time from the case, worries about the AirPods running out of battery are probably moot. In the two years we used the original AirPods we've not had any problems when it comes to listening to music and the same applies here. The AirPods 2 have a new processor, the Apple H1 chip, while the original AirPods sported the Apple W1 chip. For those paying close attention, the W1 also had duties on the Apple Watch, but in the H1 it's dedicated to headphones. Apple won't confirm that the 'H' stands for 'headphones', but that's how we're seeing it. In terms of performance, what's instantly noticeable compared to the previous version is that the connection time is reduced considerably. There is little to no hand-over lag, which became one of our bug-bears previously. We're also told this should help with improving audio latency in gaming, although we have to admit we've not noticed the 30 per cent improvement Apple has told us there should be. Although the battery in the AirPods is the same as the original offering, the new H1 processor allows for a much more efficient setup that delivers noticeably more battery life when talking. The new AirPods have the same five hours of listening time, but Apple has managed to squeeze out another hour of talk time (now three hours instead of two) - which is certainly evident in our use. Talking for longer before you hear the chime that the battery is running out is a great benefit - we think many will see this as a prime upgrade reason. Likewise, the recharge time to get the Pods back up and running has been improved. The same 15 minutes of charge still delivers three hours of listening - just as with the originals - but you'll now get two hours of talk time to finish that conference call instead of one hour. It's a small yet significant boost. New to the second-gen AirPods is the addition of Hey Siri voice control without having to double-tap the earbuds. This does save you a hand lift, but again, whether this will be valuable or not will depend on how much you use Siri. The feature works, but we never really found it a big hassle to double-tap the headphones in the first place. At least now there's the chance to use the tap control for a different action. It's fair to say that the AirPods aren't the best sounding wireless headphones on the market, mainly thanks to their open design. So if you want a decent pair of headphones that stay in when you put them in then there are better alternatives. However, that's not to say the second-gen AirPods don't sound good. They are more than good enough for calls, podcasts and music on the go. The real focus is the ease in which you can put them in, take them out, over and over, thanks to the H1 chip connectivity and ease of fitting. That's something that can't be said for other makes. We've been listening to a range of different tracks from a wide variety of artists: from Motely Crue to Pink Floyd, Drake to Taylor Swift, Massive Attack to Nine Inch Nails, and everything between. While it will cope will all the above the AirPods don't deliver a bass heavy experience, instead leaning more towards spoken word - so a better focus on calls, radio 4, podcasts, and the like. The sound is considerably better if you wear both, although you don't have to if you don't want - and that will appeal to those that are popping them in and out regularly. Where the AirPods also suffer is when you're listening in a very noisy environment as the isolation is limited. A busy commuter train passing you on the station platform will mean you'll have to turn the volume right up to still hear anything. Really, the Airpods 2 could easily be seen as AirPods v1.5 because Apple hasn't touched the overall design or sound capabilities at all. Heck, there isn't even a new colour to show you've got the new model. Replacing the originals - and you can no longer buy the original AirPods - the second-generation Apple wireless in-ears gives you Hey Siri voice control without the need to double-tap, faster connectivity to your Apple devices thanks to the H1 chip, and better battery longevity when it comes to talk time. If you are an original AirPod owner and like using them then the longer talk time from the battery is a nice-to-have, but if you want wireless charging then you can simply buy the wireless charging case on its own instead. So the new AirPods mark an improvement, albeit a subtle one. Still, with the originals already established as a good pair of portable wireless Bluetooth headphones, the second-gen neatly slot in as the replacement. Fancy something a bit more premium? That's the take with the Beoplay E8. Yes, these in-ears are a lot more expensive. No, there's no automatic H1 chip pairing. But they sound a whole lot better than the AirPods. Samsung earphones for an Apple phone - are we downright mad? Maybe. But look at it this way: these wireless in-ears are cheaper and offer wireless charging as standard, even if they can't offer automatic H1 chip pairing.